Martin Luther King Jr., a man who embodied the U.S. civil rights movement, was assassinated more than 50 years ago on April 4, 1968. Here is a timeline of events before and after his death. April 3, 1968 — King arrives in Memphis Tennessee, to support striking sanitation workers and checks into the Lorraine Motel. April 4 (before 6 p.m.) — King leaves his room at the Lorraine Motel to attend dinner at the home of a local minister. He lingers on the balcony to talk to his driver in the courtyard below. April 4 (6:01 p.m.) — King is shot and rushed to St. Joseph’s Hospital. April 4 (7:05 p.m.) — King is pronounced dead. Rioting erupts in more than 100 U.S. cities. President Lyndon B. Johnson declares a state of emergency. April 5 — The FBI begins its investigation of King’s murder, which will cost more than $2 million and involve more than 3,500 investigators. 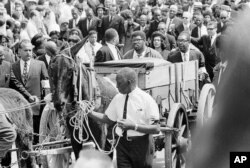 FILE - A mule cart carries Martin Luther King Jr.'s mahogany casket through the streets of Atlanta, April 10, 1968, en route to funeral services at Morehouse College. ​April 9 — King’s funeral is held at Ebenezer Baptist Church in Atlanta. More than 50,000 people accompany his mule-drawn coffin through the city. 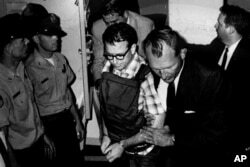 April 19 — The FBI investigation centers on James Earl Ray, 40, whose fingerprint, according to detectives, matched one on the rifle used to shoot King. The convicted armed robber had escaped from the Missouri State Penitentiary the previous year. April 24 — Ray obtains a Canadian passport under the name George Sneyd and purchases a plane ticket from Toronto to London. June 8 — Ray is arrested at London’s Heathrow Airport after trying to buy a ticket to Brussels and is later extradited to the United States. James Earl Ray being transported in Memphis, Tennessee, in this 1968 photo released by the Shelby County Register's office, March 31, 2011. ​March 10, 1969 — Ray pleads guilty to killing King and is sentenced to 99 years in a Tennessee prison. March 13, 1969 — Ray recants his guilty plea, claiming he was coerced. He maintains his innocence for the rest of his life. 1978 — Ray testifies before the House Select Committee on Assassinations, which later concludes that Ray acted alone. However, the committee concludes there was circumstantial evidence of a conspiracy. December 1993 — Former Memphis restaurateur Loyd Jowers says members of the Mafia paid him $100,000 to plan King’s assassination. Jowers says he paid laborer Frank Holt to shoot King. April 23, 1998 — Ray dies in prison from kidney and liver disease at age 70. 1999 — The King family, who believes Ray was innocent, sues Jowers for King’s death. The civil lawsuit ends with a $100 award to the King family, who donate the money to charity. June 2000 — U.S. Attorney General Janet Reno conducts a fourth investigation into Ray’s appeal, but finds no evidence of a conspiracy.